My slow cooker is my best friend and I use her at least 3 to 4 times a week (yes, my slow cooker is a girl). 🙂 If I can’t throw it together in a matter of minutes, it just is not going to happen. However, every once in a while, I completely space to put my food in the crock pot in the morning and so when dinner time rolls around, I am scrambling to find something to feed my family. I was in that exact dilemma a couple of weeks ago and came across a recipe for Baked Chicken. I love how tender and perfect my chicken cooks in the crock pot and feared that this chicken might be dry. The end result was amazing! This is definitely being added to our regular dinner rotation. This baked chicken is so incredibly tender and full of flavor- the honey adds sweetness while the soy sauce adds savory- I promise that it will quickly become one of your favorite meals! Spray a 9x13" baking pan with non-stick cooking spray. Arrange chicken tenders in single layer in pan. 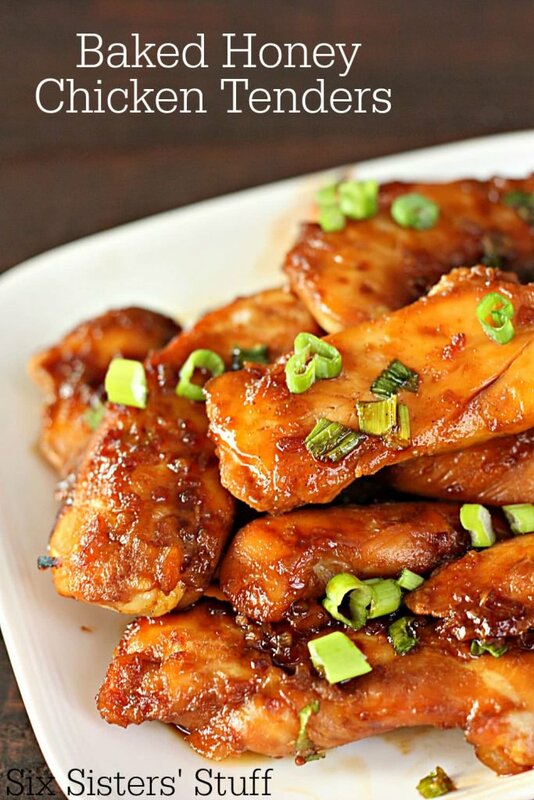 In a medium-sized bowl, mix together honey, soy sauce, ginger, garlic, and dried onion. Pour mixture over chicken. Cover pan with plastic wrap and let marinate in fridge for about an hour (I let mine marinate for about 3 hours), turning chicken once, about half way through marinating time. Remove chicken from fridge, discard plastic wrap, and bake chicken for about 20 minutes. Remove chicken from oven, turn chicken pieces over, top with sliced green onions, and return to oven and bake for 10 more minutes (or until chicken is no longer pink and juices run clear). 0 Response to "BAKED HONEY CHICKEN TENDERS RECIPE"